A consumer preview version of Windows 8 has been released to mixed reviews — but what does the horizon look like for musicians? When Microsoft made their Windows 8 Consumer Preview version available on February 29th, it got a whopping one million downloads on the first day. Having a test run of a new operating system is a great way for audio developers to start checking their existing software for compatibility problems, but I suspect many people simply downloaded it out of curiosity, to try out its very different 'Metro' front end for themselves. If this appeals to you, you'll need a decent Internet connection, since the 64-bit version is a rather large 3.3GB download, although the 32-bit version does drop to 2.5GB. Just point your browsers at http://windows.microsoft.com/en-GB/windows-8/consumer-preview and then burn the ISO file onto a CD-R, before installing it like a normal Windows CD-ROM. 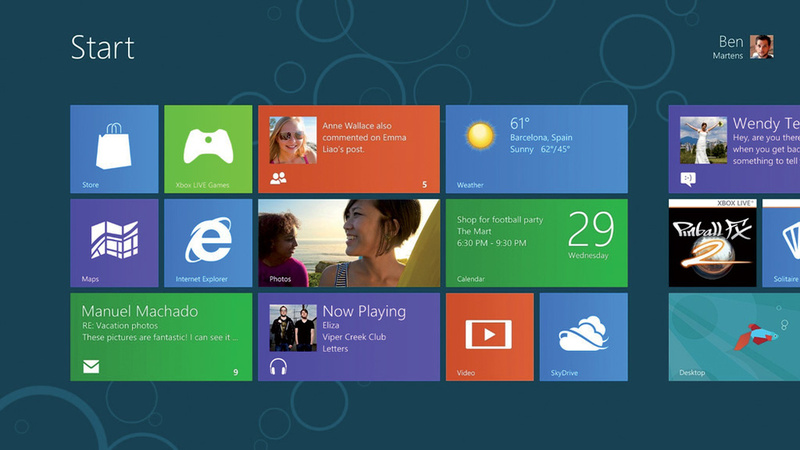 The 're-imagined' Windows 8 Start screen is getting mixed reception from punters, largely depending on whether or not they have a touchscreen. However, as with all pre-release software, don't expect to rely on Windows 8 Consumer Preview for serious work. Remember, also, that it may be substantially modified before the final commercial release, will eventually expire, and if you wish to return to your previous operating system you may have to re-install it from an image file (or from scratch if you haven't made an image file). If you simply want to find out more, you can download the rather more modest 64-page Windows 8 Consumer Preview Product guide from the same web address. 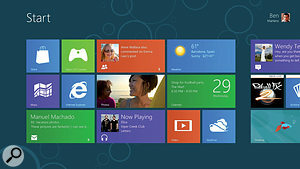 You'll also get plenty more choice if you wait until the official Windows 8 release date this Autumn. Projected versions include Starter, Home Basic, Home Premium, Professional, Professional Plus, Enterprise, Enterprise Eval, Ultimate and ARM. Opinions still seem to be mixed amongst those consumers who have now tried Windows 8 for themselves. Many love the very new Metro front end and its touchscreen compatibility (see screenshot), hailing it as a revolutionary step forward in line with the increasing popularity of the tablet format, while others still can't see the point of these fundamental GUI changes when the vast majority of us still rely on a keyboard and mouse. The tablet is a wonderful interface for many tasks, but it's scarcely going to appeal to touch typists! For the musician, a touchscreen interface can be wonderful for performance control and for intuitive mixing, especially if you have a screen with multi-touch capability so you can move several virtual faders simultaneously (Windows 8 supports up to five simultaneous touch points), but, as always, I suspect the dedicated multi-channel controller will continue to dominate for those running larger projects, until larger touchscreens become more cost effective. Windows 8 audio will see the return of hardware-accelerated audio using the WASAPI (Windows Audio Session API) functions first seen in Windows Vista, although, in practice, the vast majority of us will continue to bypass such features because we rely on ASIO drivers. Ultimately, our Windows 8 experience will depend on how open we are to new control concepts, but many musicians who spend the vast majority of their time with their main sequencer application maximised while creating music may not even notice they are running a new operating system! Anyone patiently waiting for Intel's Ivy Bridge processors to be released before buying or building a new PC may be in for a disappointment, as only a few chips will be 'trickling out' in April as you read this, despite the initial promise of an 'early Spring' launch. Instead, Intel have decided to hang fire until June, or even July, for reasons that are currently unclear (rumours range from clearing out stock of the current-generation Sandy Bridge line to delays in the new Ivy Bridge 22nm manufacturing process). Sadly, this will also have a knock-on effect on the release of some of the latest Ultrabook-format PC designs with their ultra-slim form factor of 20mm or less, instant-on capability using lightning-fast SSD storage, and at least a five-hour battery life. With a target price of around $1000£699, Intel were hoping that their Ultrabook format would achieve a consumer laptop market share of 40 percent during the next year. However, while there are plenty of Ultrabooks featuring Sandy Bridge processors already available from OEMs such as Acer, Asus, Dell, HP, Lenovo, LG, Samsung and Toshiba, the cooler running and higher performing Ivy Bridge Ultrabooks seen as concept models at various trade shows now seem likely to be delayed. First seen at the Consumer Electronics Show 2012, Lenovo's IdeaPad Yoga 360-degree flip-and-fold Ultrabook design is a real taste of the future.It does make you wonder if Intel are hanging on until more manufacturers can release Ultrabooks with multi-touch screens running Windows 8, which should really boost sales. 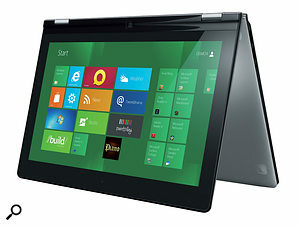 One of the most interesting of the latter is Lenovo's IdeaPad Yoga, first seen at the Consumer Electronics Show 2012. This novel design features a 360-degree 'flip and fold' format that can either function as a normal laptop or a ten-finger multi-touch tablet with the keyboard on the reverse side. It's just 16.9mm thick and has a claimed battery life of eight hours and a release date scheduled for the second quarter of 2012. Hang on in there!